Liz Cambage goes to the basket. Photo by Layne Murdoch/NBAE via Getty Images. 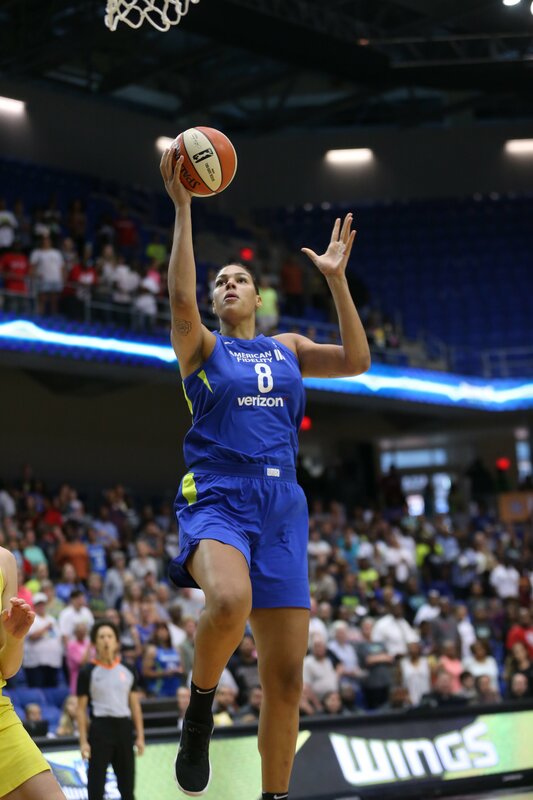 After flying high on a five-game winning streak in early July, the Dallas Wings have descended – after losing six-straight games – to the bottom of the playoff picture as the eighth seed, with a two-game lead over the Las Vegas Aces. This season the Wings were primed to flourish under the leadership of veteran point guard Skylar Diggins-Smith and the re-addition of Australian center Liz Cambage. And to be sure, neither player has disappointed. 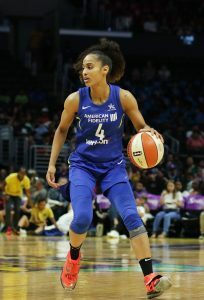 Diggins-Smith is averaging 18 points and 6 assists per game, which puts her in the top 10 in the league in both statistical categories. Cambage, at 6-8, averages almost a double-double, with a league-first 23 points per game average to go along with 9.6 rebounds per outing. But the one-two punch has not been enough to propel Dallas in the standings, and the team appears to have imploded as of late, as they lost their sixth straight game Wednesday. Miscommunication on defense: With Cambage in the middle, it makes it difficult for teams to score in the paint. But lately, opponents seem to have figured out how to prevent her from getting to her spot on the box. The most recent example was against the Sun, who were able to score from seemingly every area because they are the second-best shooting team in the league and are dangerous from beyond the arc. Connecticut shot a staggering 56 percent in the contest. Great shooting is not impossible to defend, but often times Dallas players seemed to get lost switching defensive assignments. When a team gets Cambage out of the paint, she can be beat with speed, and when that happens the help defense is late to rotate, which gives the opposing team a good look at a high-percentage shot. During their current losing streak Wings’ opponents are averaging 88.3 points per contest, while during their winning streak they allowed just 76.8 points per game. Dallas was more disruptive when winning, as they held teams to 49.9 percent shooting. Coach Fred Williams said the team is trying, but trying and doing are two different things. “Defensively, you just have to bear down in the paint. It’s just the will to get down and do it,” Williams said. Skylar Diggins-Smith looks for the best passing option. Maria Noble/WomensHoopsWorld. There is no third or fourth option: The offense cannot begin and end with Cambage. When the Wings get into transition they can run with anybody, but when they have to run their play sets, their offense looks scattered when they do not get the first look that they want. When Cambage is taken out of her comfort zone, Dallas has not been able to make teams pay for the double- and triple-teams that they pile on her, which leave many others open. This is especially true from behind the arc, they are last in the league in three-point shooting, at 26.1 percent – a significant drop from 31.4 during their winning streak. Besides their shooting woes, there is not much depth as it initially appeared for this team. Diggins-Smith is leading the league in minutes with 34.3 per game. The signing of Leticia Romero was supposed to bring her relief at the point, and the Wings also tried sliding Kaela Davis to the one spot. Neither option has panned out well, however. Guard Aerial Powers was providing some relief, but she was traded to the Mystics three weeks ago for veteran Tayler Hill. And though Hill has already been vocal in team huddles, integrating her into the system will take time that the Wings don’t have, as seven of eight playoff spots are now claimed. 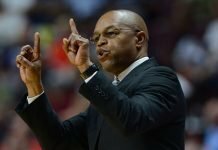 After the Connecticut loss, which saw their opponents run away with the win in the game’s closing minutes, Dallas had a players-only meeting on the court immediately afterward, which continued in the locker room. Diggins-Smith said no one is blaming one another for the team’s struggles, and that they are unified. The Wings have very little time to close out, as the regular season ends Aug. 19. And their schedule is tougher than most: they play four of their final five games on the road starting with back-to back games. 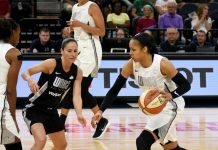 Their opponents include the second-place Atlanta Dream, the third-place Washington Mystics, the fifth-place Sun, the Las Vegas Aces and the No. 1 Seattle Storm. Williams said it will come down to execution.